Maxwell dropped Dhoni when he was on duck and it turned out to be the game-changing moment eventually. 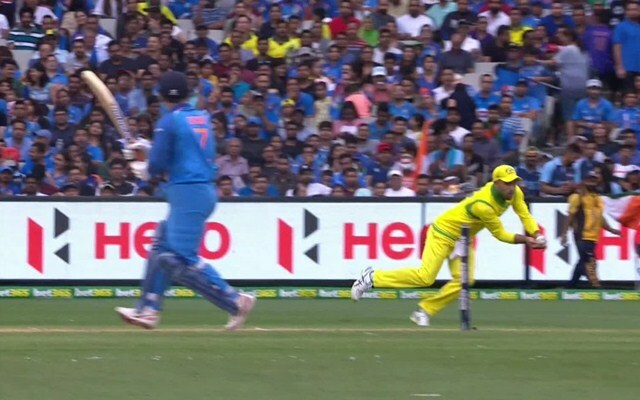 Glenn Maxwell, one of the better-known fielders in world cricket, would be thinking himself in the place of Herschelle Gibbs of the 1999 World Cup after dropping a sitter to reprieve MS Dhoni in the deciding ODI against Australia in Melbourne on Friday. The ace wicketkeeper-batsman was batting on duck in a pressure situation when he was dropped by Maxwell after he hit a widish delivery off Marcus Stoinis. It was a day when MSD was destined to remain unbeaten as the opponent failed to run him out in the 21st over and also escaped after nicking one to the wicket-keeper. The former India captain remained not out on 87 – his third fifty in the series in as many matches – to guide India to a historic 7-wicket win. The victory gave India their maiden bilateral ODI series victory Down Under. That Glenn Maxwell was thinking about the dropped catch became evident after he reacted on Twitter to a dramatic moment from the first semi-final of the Women’s Big Bash League. It was a game between Brisbane Heat and Sydney Sixers in which they needed five runs in the final delivery while chasing a target of 141. Nicola Carey, who is just a year into international cricket, was batting while the bowler was left-arm orthodox bowler Jess Jonassen. Jonassen tossed it up on the leg and Carey slog swept and the ball was looking certain to cross the boundary, pushing the match into the super over. But the fielder who was located at deep square leg, Haidee Birkett, covered considerable ground to her left to pick the ball from the air to take the Heat into the final. The batswoman was distraught to see the unbelievable catch being taken while the opposite reaction was visible on the bowler’s face after she went to her knees, giving up all hope. Maxwell found solace in Birkett’s miraculous catch after himself missing an easy one and he replied to the video tweet by cricket.com.au showing the moment from the women’s match saying “Any tips appreciated Haidee”.